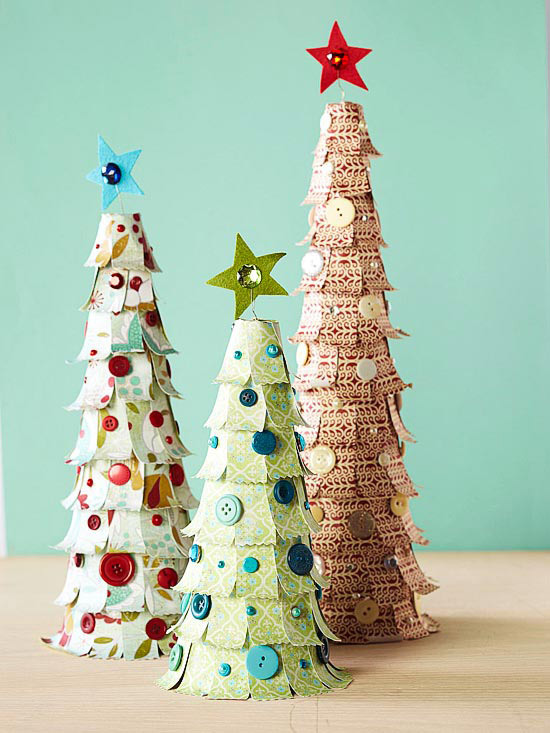 Spruce up your holiday decor with patterned-paper trees. Cut or punch a decorative edge from 1x2-1/2-inch and 3/4x2-1/2-inch strips of patterned paper; curl the edges by wrapping them around a pencil. Hot-glue the pieces to a foam cone (ours are 9, 12, and 15 inches tall). 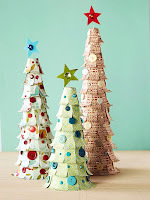 Top each tree with a star cut from felt and held in place with wire. Add a gem for sparkle. Trim the tree with button, brad, and gem ornaments. To make a pretty floral gift, cover a block of florist's foam with button mums. Stick a pearl-head pin through the center of each flower to secure it to the foam. 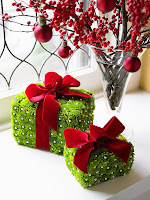 Tie a red velvet ribbon around the finished package, or hot-glue it to the top. These rock candy-embellished cones are a fun -- and easy! -- holiday craft project. Pour horizontal rows of candy crystals in three or more colors on a baking sheet with the rows flush together. Wrap solid light-color cardstock around foam cones, slightly overlapping the paper at the back of the cone and securing it with hot glue. Do not apply the glue directly to the cone, which will melt. Larger cones may need two sheets of paper to be completely covered. 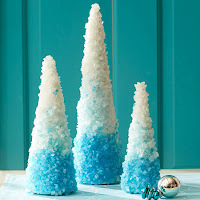 Spread crafts glue on the cones and roll them in crystals; let dry. Re-glue and re-roll, if needed, to cover cones completely with crystals. Use hot-glue to fill in small gaps with hand-placed crystals. 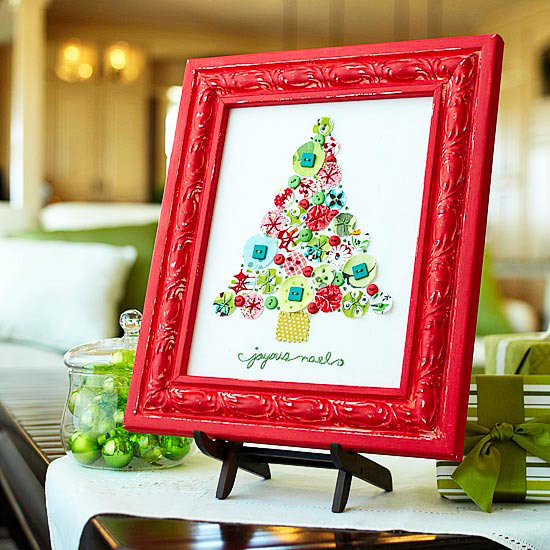 Craft a clever Christmas tree from colorful fabric scraps and display it front and center in a bright frame to make a fun holiday decoration. Using coins as pattern templates, draw around coins on assorted fabric scraps. Cut out. Cut a 1-inch square from gold print fabric for a tree trunk. 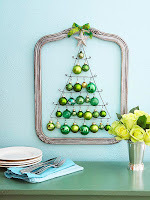 Referring to the photo, fill tree shape with fabric circles, attaching circles with red or green floss and French knots, straight-stitch stars, or with square buttons on top. In spaces between circles, sew French knots with green floss and attach red and green buttons with matching floss. Whipstitch tree trunk in place with gold floss. Frame the finished piece. 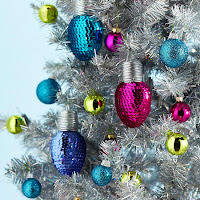 These colorful ornaments will light up your tree in vintage style and bold colors. For the bulb base, press a 1-1/2-inch plastic-foam ball on a work surface to flatten one side; repeat to flatten the opposite side. Roll the shape back and forth on the rounded edge, pressing down until the bulb base resembles a marshmallow. Press in one flat edge of the bulb base with your thumb, making it concave. Hot-glue the concave edge to the wide end of a 2-inch plastic-foam egg (this will form the ornament shape). Place a line of hot glue between the bulb and bulb base and attach one end of colorful sequin trim. Continue adding lines of glue and wrapping the trim around the bulb, overlapping the trim slightly as you work; cut off excess trim. Poke a hole in the center of the flat edge of the bulb base with the tip of the glue gun. Make a small loop at one end of a length of metallic cord, leaving a long tail. Push the ends of the loop into the hole; let the tail trail out of the hole. Place hot glue on the bulb base around the loop; attach and coil the cord on the base around the loop. Continue wrapping and gluing the cord to the bulb base until it is completely covered; cut off excess cord. This brightly-colored Christmas collage is a great festive addition to bookshelves, nightstands, or coffee tables during the holidays. To make, paint a 6-inch stretched canvas with red acrylic paint; let dry. 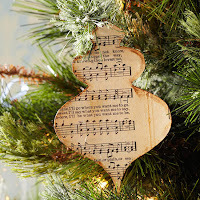 Referring to the photo, use decoupage medium to adhere a hill shape torn from sheet music to the bottom of the canvas. Evenly cover a purchased two-house foam stamp (collegeartist.com) with light green acrylic paint; stamp houses on canvas atop the hill. Stamp a snowy sky above the houses with circle foam stamps and white acrylic paint. Stamp a striped design around the sides of the canvas with white acrylic paint and stamp a scallop design with teal acrylic paint along the bottom. 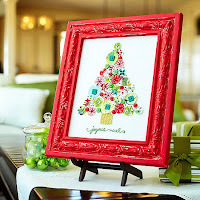 From a red ink pad, stamp a doodle frame design onto a scrap of pale yellow cardstock; cut out the frame and frame center and adhere to the canvas with decoupage medium. Cut holiday-theme words from an old book and adhere them inside the frame. 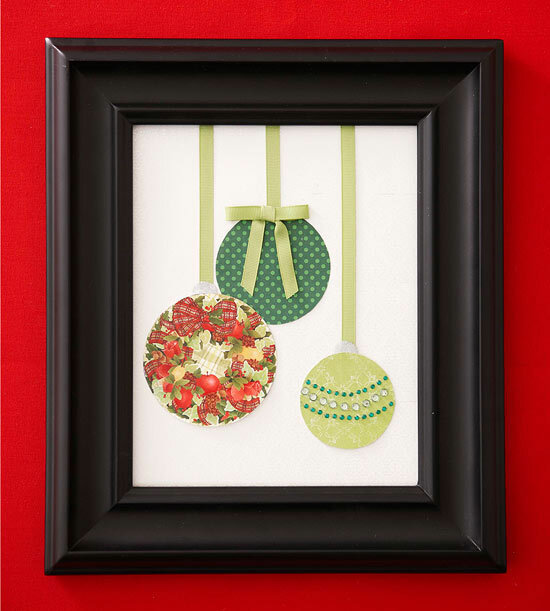 Christmas ornaments don’t have to be just for your tree -- here, they come together for holiday artwork in minutes with paper circles cut from repurposed Christmas cards and festive ribbon. Grab three old Christmas greeting cards in coordinating colors and cut out three different sized circles from each. For the ornament caps, punch two circles from metallic silver cardstock using a 1/2-inch circle punch. Glue a circle at the top of the small and large ornaments, tucking half of each circle behind the ornament shape. Position ornaments on a sheet of white-on-white patterned paper; mark positions with a pencil. Cut a length of green grosgrain ribbon for each ornament hanger; tape the ribbon ends to the paper with double-sided tape. Tape the ornaments in place and tie a bow from the remaining ribbon. Adhere the bow to the top of the medium-size ornament with crafts glue. Frame the design for a polished look. 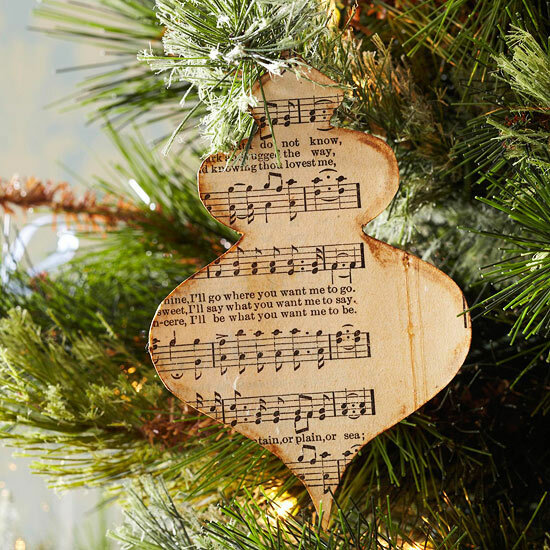 Strike up a merry chorus on your Christmas tree with these handmade ornaments made from sheet music. To make, place old sheet music in water until it is just damp; blot off excess water with a towel. 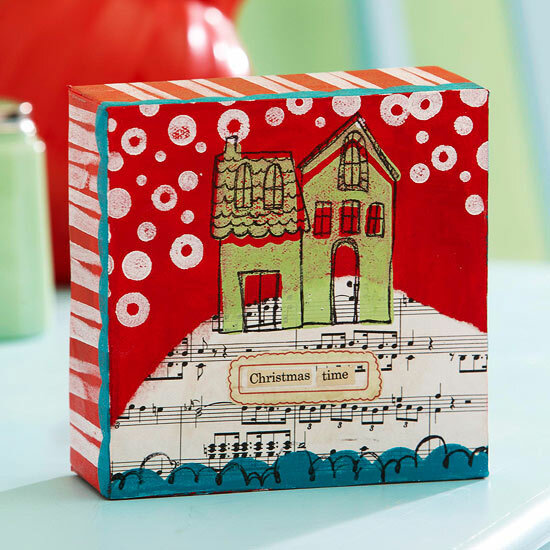 Apply a thin, even layer of decoupage medium to a piece of cream cardstock; immediately place the damp sheet music on the cardstock. Roll rubber brayer over the sheet music to smooth it and push out air bubbles; let dry. Trace the ornament patterns, available below, onto white paper and cut out. Trace the paper patterns onto the wrong side of the cardstock; cut out shapes using a crafts knife. Erase any remaining pencil marks, and make a hole in the top of each ornament with a needle or a hole punch. Rub a cotton swab in sepia ink and rub the swab along the front and back edges of each ornament. Apply several layers of decoupage medium to both sides of each ornament; let dry between coats. 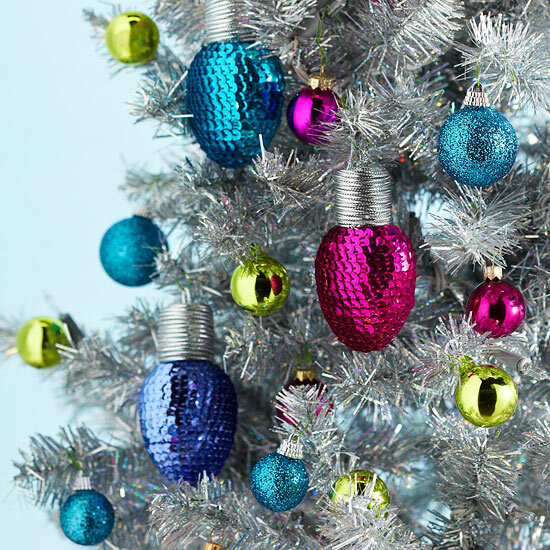 To hang, thread a wire ornament hanger or a ribbon through each ornament hole. 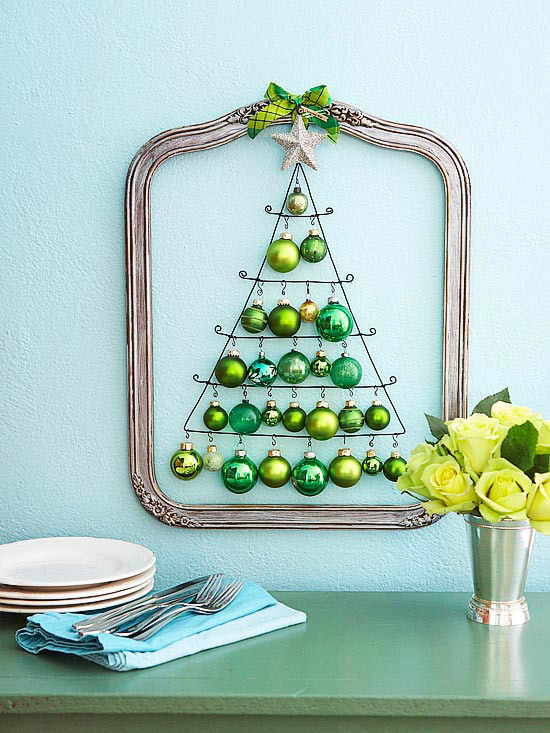 Gather your favorite collectible ornaments and trim the boughs of a whimsical art piece. 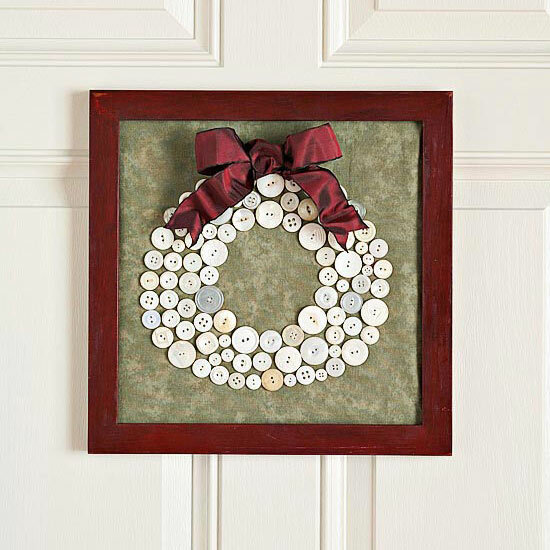 Hung inside a frame topped with a bow, the ornaments are the center of attention. 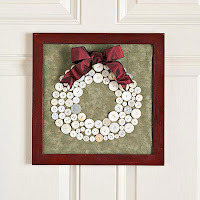 Gather white buttons from your stash and sew them onto fabric to make a wreath that's suitable for framing. 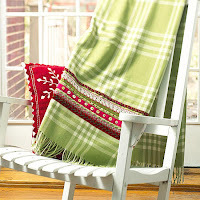 Give a purchased blanket a personalized touch with ribbon and pretty stitching in red and green. 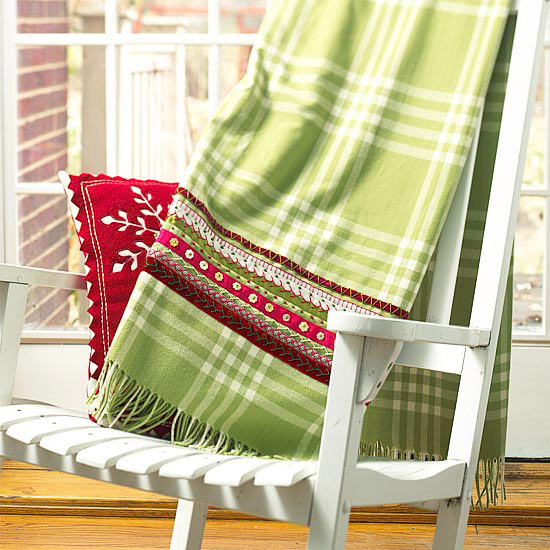 The result is a cuddly throw, perfect for a Christmas gift or an extra cover for holiday guests to use. If making cutout cookies isn't your thing, use cookie cutters in a new way this Christmas. To make this wreath, arrange large cookie cutters on a paper-covered work surface in a circular shape, and fill in the gaps with smaller cookie cutters. Glue the arrangement together with an adhesive appropriate for metals; let dry. 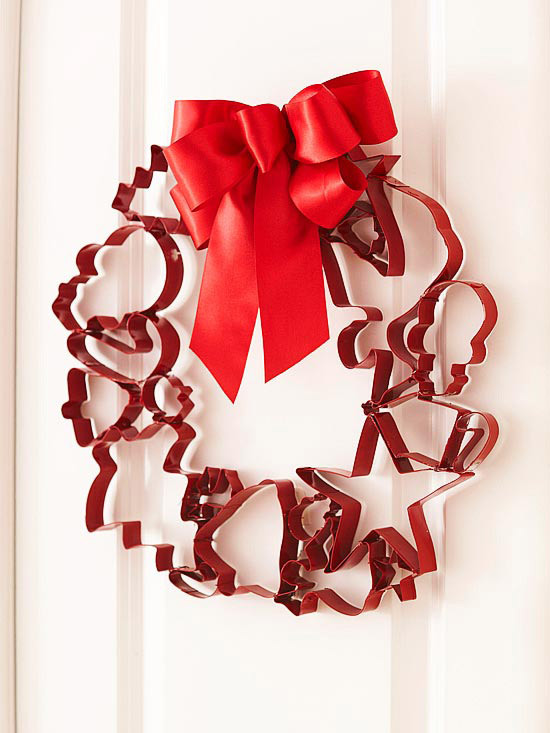 Spray-paint the wreath, if desired, and finish with a festive bow. 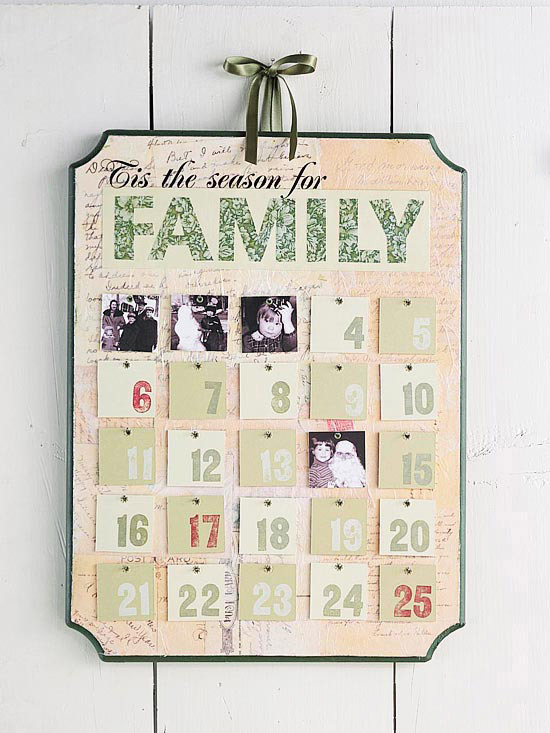 Build anticipation for Christmas day with a handcrafted countdown calendar. 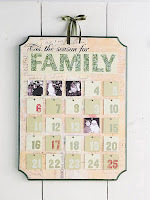 Basic crafting supplies, a computer, and your creativity can transform a plain wooden plaque into a calendar filled with family photos.